1 of 5 Heat oven to 400 degrees F. Unfold one piecrust and fit into 9-inch glass pie plate. 2 of 5 Place the strawberries, rhubarb pieces, sugar, cornstarch, salt and nutmeg in large bowl; stir gently with a spatula to combine; do not crush the strawberries or rhubarb. 3 of 5 Unfold second piecrust on lightly floured surface and flatten slightly with rolling pin. Cut out six 1-inch strawberry patterns in a circle in crust. Use the scraps to cut out strawberry leaves; reserve the leaves on a sheet of waxed paper. 4 of 5 Spoon strawberry filling into crust-lined pie plate. Gently place second piecrust over top of filling. Fold edge of top piecrust under edge of bottom piecrust; crimp edges of crusts together to seal. 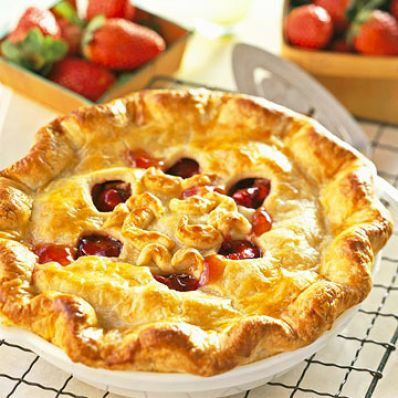 Arrange dough leaves next to the strawberry cutouts in the crust, using a little water as glue. 5 of 5 Bake in 400 degree F oven for 50 minutes or until the crust is golden and filling is bubbly. If the edges of the crust start to get too brown, cover the edge with a piece of aluminum foil. Transfer pie to wire rack and let cool completely. Makes 8 servings.